For decades, hardwood flooring has been a coveted choice for a look that is both elegant and timeless. However, there are just certain rooms that real wood flooring doesn’t serve as well, especially those that are moisture prone such as kitchens, bathrooms, and basements. With our stunning collection of vinyl planks, you no longer have to be without the high-end look you want because of moisture. Our stunning collections of vinyl plank flooring include varieties of species that look just like the real thing. Thanks to modern imaging technology, floor manufacturers are able to create detailed 3D scans of real wood planks, and mold vinyl to look just like the original board. You are able to feel the grooves of the wood by running your fingers across the boards. Unlike its wood counterparts, this flooring is created from a waterproof material. Even if you want wood floors in your bathroom, you now have a wide variety of stylish choices. This durable material is also perfect for high traffic areas or homes with pets. Due to its sturdy nature, this flooring choice is able to withstand any kind of damage and look attractive for years to come. 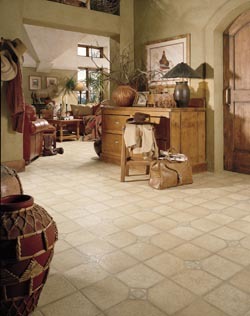 Vinyl tile flooring bridges the gap between real ceramic tile and laminate tile. Thanks to the same 3D imaging technology that is used in vinyl planks, manufacturers are now able to do the same with tile. With so many styles and colors to choose from, these tiles make the perfect choice for homeowners looking for affordable and beautiful flooring. Just like real tile, vinyl floors of all types are simple to clean. The occasional mopping keeps this flooring looking great for its entire life, and thanks to its durability that will be a very long time. Like other types of vinyl, vinyl sheet flooring is waterproof, but there is one big difference that sets it apart from the other types. Sheet flooring comes in a single solid roll that is cut to the size and shape of your room. This makes it the perfect waterproof solution for bathrooms, because there are a lot less gaps where water is able to get through. As long as the edges are properly sealed, your floor is virtually waterproof. Once you have picked out the perfect flooring for your home, let us install it for you. Our professional vinyl flooring installation experts are able to quickly and efficiently give your home the flooring of your dreams. You are only one visit away from having the upgrade you seek for the interior décor of your home. Contact us for all of your vinyl flooring needs. We serve clients in Owen Sound, Port Eglin, Wiarton, Kincardine, Hanover, Meaford, Flesherton, Tobermory, ON, and the surrounding areas.